SHOPPING ARCADES, OFFICES, FLATS, CAR PARK. WHAT , ultimately, will be the answer to the Central Station area development deadlock ? The British Transport Commission has Said that the 1938 plan of setting the station back to Chapel street would now be far too costly. Although there have been frequent meetings between top-level railway officials and corporation representatives since the war, the talks have largely been unproductive. Presently both sides are working on a new scheme providing tor a new station on substantially the same site as the existing one, but designed more on the lines of a "through" station than a “terminal”. This would mean that access to the platforms would be by overbridge or subway from the centre.:. instead of from the north end at ground level. While the experts talk round their drawing boards others speculate. including Mr. Harold Tunstall. Aged 35, of Victory road, a member of the Tower Company's publicity staff. 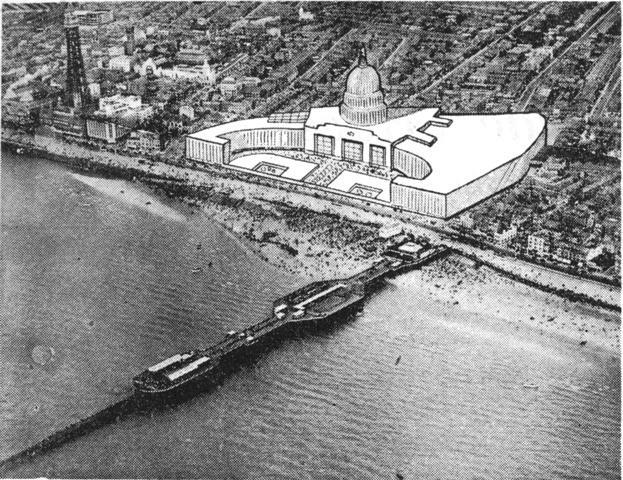 He has produced the plan pictured here, and he thinks it answers "some, if not all of the problems connected with this valuable area in the centre of a growing Blackpool. Mr. Tunstall has made it a tall building throughout because “we must learn to build up gracefully, rather than untidily as is now the fashion.” He goes an: "Imagine a concrete lid across the present station and platforms from Central Drive to Bonny Street. This would be our ground floor and modem shopping arcades. "Under the large central dome at ground level would be a big central booking hall." The station entrances would lead east to Central drive and west to the Promenade. The north and south wings of the building Mr. Tunstall makes identical—ground floor shopping arcades, second floor offices and the rest flats. Between the north 'flat" wing and the central booking hall he sees a glass-roofed conference hall, surrounded by railway administrative offices. Between the south "flat" wing and the booking hall he puts an eight or nine floor car park. 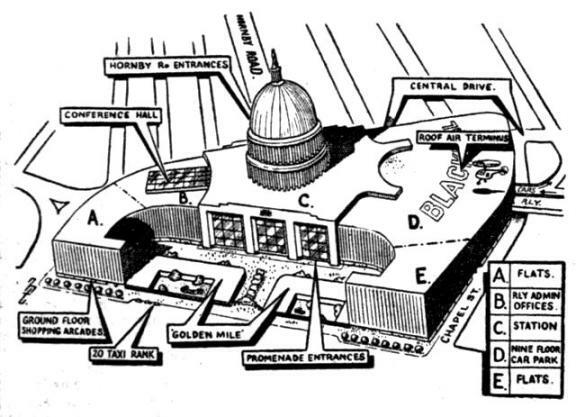 The roof, says Mr. Tunstall, could be used for helicopter landings, with air administrative offices at the base of the dome. The walls of the dome, he believes, could be permanent TV or radio studios. Between the "paws" of the two wings a new Golden Mile would be housed indoors, and it would be screened from the front with a windowed wall. Comments Mr. Tunstall: "My only interest in the subject is my desire to see Blackpool grow on the right lines." A Corporation official sold: "Mr. Tunstall's scheme makes a good talking point for the man In the Street. "It might also encourage the Town Council to adopt a broader conception of the sort of development that is needed in the centre of Blackpool"